Red Post / Red "Authorised Access Only"
Red Post / Red "No Entry"
Yellow Post / Yellow "Authorised Access"
Yellow Post / Yellow "Caution Do Not Enter"
Yellow Post / Yellow "Danger Keep Out"
Yellow Post / Yellow "Out of Service"
What is the purpose of a Retractable Barrier Post? This retractable post is designed to control the flow of human traffic and can be used in a variety of places for a variety of purposes. It is created as an option for anyone who needs an item that can be moved and set up easily. Where can this Queue Management System be used? 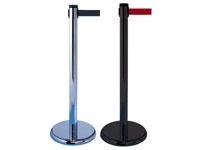 This pedestrian post can be used almost anywhere, since you do not need a wall or other surface to mount it onto. 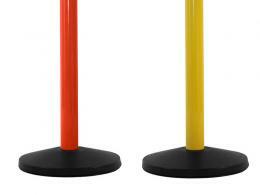 You can take a retractable barrier post almost anywhere and quickly set it up. There is no lengthy installation, so you can have it up in minutes. This product is perfect for blocking off areas with dangerous terrains or spaces that contain dangerous substances. It can also be used to control human traffic at parties, concerts, clubs, and more. 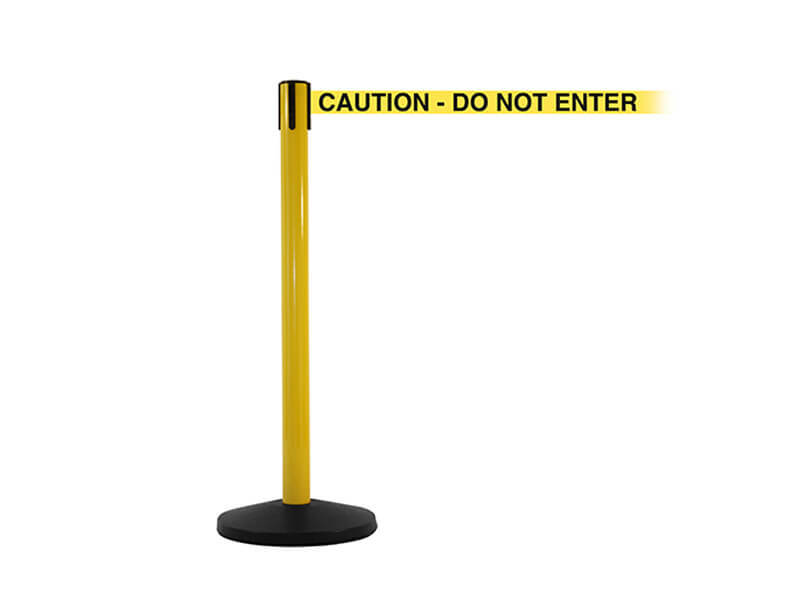 This barrier post can be used anywhere that you need to control the flow of human traffic to keep people safe or to keep them out of an area. 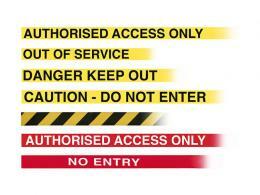 If you need to block off an area of a lab or a warehouse because of dangerous substances, or if you need to control traffic at a social event, this item could be a great choice. A retractable barrier post is the perfect choice if you need a way to control pedestrian traffic without having to install something into a wall or other surface. These items stand on their own, and they can easily be placed anywhere. If you need to use them at multiple events, you will be happy to know they can be transported easily. These poss have a belt lock in place to prevent accidental release. You can choose between a bright yellow or rich red for the post and belt, depending on your preferences. For the belt you can choose yellow and black chevrons or a safety message that will be printed on both sides. The size of the belt is 3.4m x 50mm. The post height is 1050mm. This item has a weight of 9 kg, making it sturdy enough to stay put and light enough to move. If you are interested in a bespoke design, please get in touch with a friendly member of our sales team. Our main priority is making sure that our customers find the perfect item for their needs, and we are always happy to help.